UEFI BIOS and the Standard Legacy BIOS - PC Buyer Beware! This section of this website should provide the owners of desktop and laptop PCs with all of the information they need to know about the old-style standard legacy BIOS setup program that starts up from battery-powered flash RAM memory and the new UEFI/EFI BIOS that starts up from permanent, non-volatile memory that doesn’t use the motherboard’s battery when the computer is turned on, which then configures a computer’s hardware so that the operating system, mostly Windows, can recognise it and load its software device drivers. 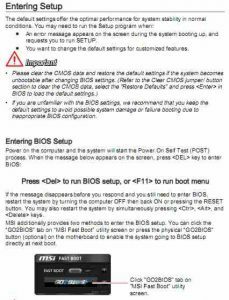 December 21, 2018 – Note that the UEFI BIOS is updated by using firmware updates that are much more complicated than standard BIOS updates. Users used to get away without updating the old-style standard BIOS unless an update was required to fix a bug or add support for new hardware. However, the UEFI BIOS incorporates security features that require updating, often frequently due to the discovery of new security vulnerabilities. The implications are too involved to deal with on this page, so here is link to an article that does a good job. The third-party developers of the new UEFI BIOSes are the same developers that created the Standard legacy BIOSes – AMI, Award, Phoenix, etc. A standard legacy BIOS can be entered to examine or change before Windows starts to load by pressing its entry key, which is usually the Del or F1 key. An instruction on the startup screen says something like: “To enter setup press Del” or “DEL: Setup”. That entry method is also usually used by a UEFI BIOS, but that may not always the case because the UEFI can be entered from within Windows 8.1/10 by following a long click path and the motherboard manufacturer might want to make entry as difficult as possible. You should consult the PC’s user manual or its motherboard’s user manual for information on the UEFI. You can use the free CPU-Z utility to identify the make/model of motherboard and then visit the manufacturer’s website for the user manual, usually in the PDF format. 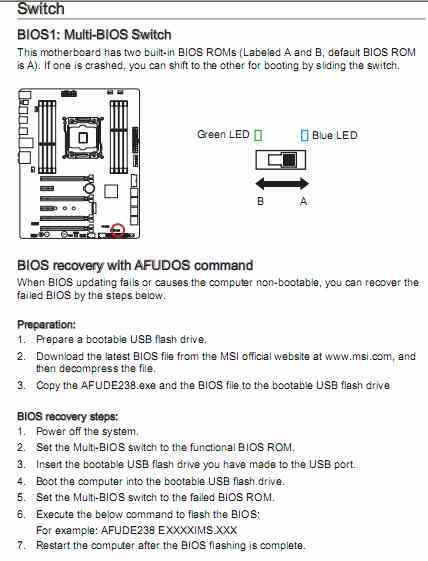 The image below shows that information provided by the user manual of a MSI motherboard from 2015. Click on the image to view its full size. Some motherboards manufactured by MSI provide two UEFI BIOSes and a switch that allows switching between them. You should read your PC motherboard’s user manual to see what features it provides with regard to the UEFI/BIOS itself and other components. Note that desktop and laptop PCs now store the UEFI settings in non-volatile permanent memory that retains information when the PC is switched off, which means that the UEFI does not require to make use of a battery supplied by the PC’s motherboard to retain its data. However, motherboards still have a battery because the Real Time Clock (RTC) that keeps date and time information has to be powered. The operating system takes its date and time from the RTC. The UEFI is not accessed by pressing an entry key (Del, F1, etc.) at startup, it is accessed from within Windows 8.1 and Windows 10. The following short video shows the easiest but still very involved way in which to access the UEFI settings. UEFI access is much the same in Windows 8.1. Access has no doubt been made as difficult as possible so as to prevent users from screwing up their systems and then requiring support to come right. Note that if you are using a wireless keyboard, it might not allow you to enter the BIOS. In which case, you’ll have to use a wired PS/2 or USB keyboard. Moreover, when a desktop or laptop computer starts up – boots – only certain USB ports might be active during the boot, so, if you are using a wired USB keyboard and you can’t access the BIOS, try using the other USB ports. Common BIOS-related problems are dealt with in this article instead of having their own section, because there aren’t many of them. 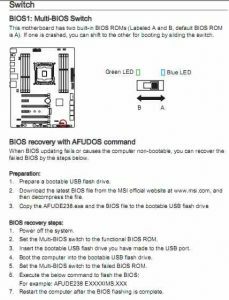 Most BIOS-related problems are fixed by either updating or resetting the BIOS, both of which are dealt with in this article. If you have enabled setting and the computer fails to boot, enter the BIOS and enable the optimised or fail-safe default settings option. 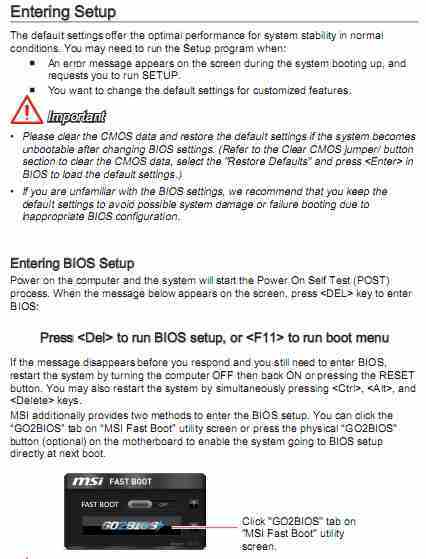 The Reset Configuration Data setting makes the BIOS reconfigure the hardware. Click on Common BIOS problems to go to them. Information is provided on both the decades-old keyboard-accessed standard BIOS and the new mouse, touchpad or tap-accessed UEFI BIOS, which is required for hard disk drives that have a storage capacity greater than 2.19GB. 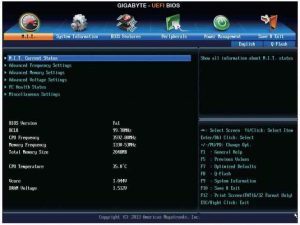 Note that the settings that are made accessible in a UEFI/BIOS depend on the computer’s manufacturer or the motherboard’s manufacturer if you buy or build a PC and install your own motherboard. If the computer is made for gaming enthusiasts, for example, if will no doubt provide a full range of customisable BIOS settings, such as settings that allow the overclocking of the components, running them faster than their stock speed, whereas if it is made for the typical home user, the computer manufacturer will probably provide only the basic settings in order to prevent the user from messing about in the BIOS and causing problems that require solving from its expensive support staff. For that reason, most laptop and netbook computers usually don’t have a BIOS that allows much in the way of customisation. The BIOS setup program – an acronym for Basic Input/Output System – is currently still a vital part of a PC’s system, without which nothing can work. It was present in the first PCs made by IBM and is still in use in now (2014), more than 30 years later. The standard keyboard-driven BIOS configures the PC’s hardware so that the operating system (Windows, Linux, OS X, etc.) can recognise all of it and install the appropriate software device drivers. The program itself is stored in a CMOS flash memory chip on the motherboard and it can be upgraded by reflashing the memory chip with the update according to predetermined procedures. 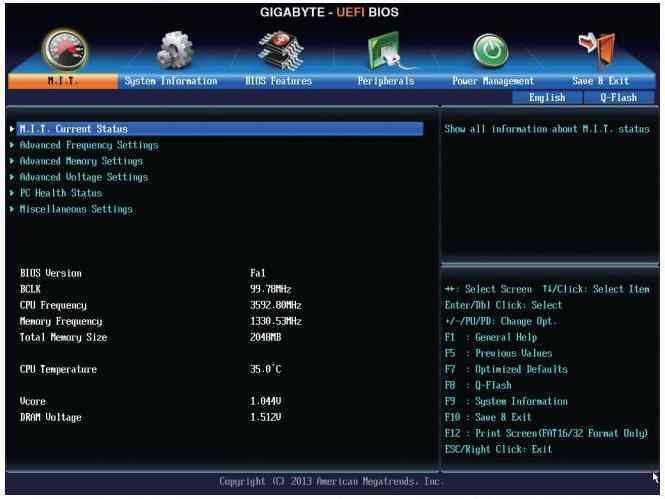 However, the standard BIOS has been replaced in new computers by a mouse-driven Unified Extensible Firmware Interface (UEFI) BIOS, also known simply as an EFI BIOS. Development of the UEFI BIOS was started by Intel in the mid 1990s. Windows PCs started using the UEFI BIOS, which is the replacement for the decades-old standard BIOS, with the release of Windows 8 in 2012, so most desktop and laptop PCs bought new since then use a UEFI BIOS. The standard BIOS, stored in a flash-RAM chip, boots before Windows to run the Power On Self Test (POST) that checks that the hardware components are functioning and configures those components for Windows so that it can load their software device drivers. The standard BIOS of a PC can provide many configuration settings, depending on how many the desktop or laptop PC manufacturer is prepared to allow. The manufacturers of laptop and desktop PCs used for office work usually prefer to have the BIOS or UEFI as limited (or difficult to access, as in the case of the UEFI BIOS) as possible in order to prevent users from getting into the kind of trouble that requires costly customer support. However, PCs or motherboards or laptops bought by power users usually have a BIOS or UEFI that provides the customisation settings that such users are likely to want or need, such as those that allow the processor and RAM memory to be run at higher frequencies than their stock frequencies (to be overclocked), either by enabling settings manually or enabling automatic settings. The early versions of the UEFI BIOS used in PCs running Windows Vista were more or less the same as the standard BIOS but with mouse operation instead of the keyboard-only operation of a standard BIOS. All devices require a device driver to operate, so the keyboard and mouse drivers have to be loaded by the BIOS/UEFI itself in order to be used. The flash-RAM chips of the standard BIOS were of small capacity due to the cost of flash-RAM, so only keyboard navigation was used. Windows 7 PCs came with a more developed UEFI BIOS that allowed access to the settings while running Windows. If you are still using Windows 8.0, you should upgrade to version 8.1 in order to be able to get patches and security updates, because Microsoft only supports Win 8.1. You can also upgrade to Windows 10 Home or Pro editions in 32-bit or 64-bit versions that match your qualifying edition of Windows 7 SP1 and Windows 8.1 if your computer passes the hardware tests that Microsoft’s Windows Update site performs on it. The upgrade to Windows 10 was free until July 29 2016. Now the Windows 10 Home and Pro 32-bit and 64-bit versions have to be purchased. Have a look on Amazon for pricing and purchaser reviews. Windows 8.1 and Windows 10 make as much use of its UEFI as the manufacture is prepared to provide, such as providing startup protection from rootkit infections. Rootkit infections operate under Windows, so require special software to detect and remove them that can be updated like anti-malware scanners. Some malware scanners have built-in rootkit scanning, such as the Malwarebytes free and Pro-version scanners. The free scanner has to be run manually and does not monitor a system in real time. Unfortunately, UEFI protection is intrinsically bound to the installation of Windows 8.0/8.1/10, thereby making it problematic to boot the system with another operating system’s boot disc (for example, Ubuntu Linux can be run from its boot disc or be installed on the system) or to run system-boot recovery/repair discs created by third-party developers. The UEFI protection setting called Secure Boot prevents that from happening unless the boot disc has a digital signature from Microsoft that gives it a pass or Secure Boot is disabled.